Another big national election means another big collaborative fact-checking initiative. But this one will get a small but important assist from the Facebook-owned messaging behemoth WhatsApp — where a healthy share of the world’s misinformation gets distributed. Comprova, a fact-checking collective made up of 24 newsrooms around Brazil, launched Monday. It will monitor mis- and disinformation in the lead-up to the country’s elections on October 7 (and the second round of runoffs October 28). Like the 90-organization strong Verificado in Mexico, and First Draft-run fact-checking collaborations like CrossCheck before it, the partner newsrooms will collect tips, respond to rumors and information that it finds spreading, publish stories, and sometimes report collectively. 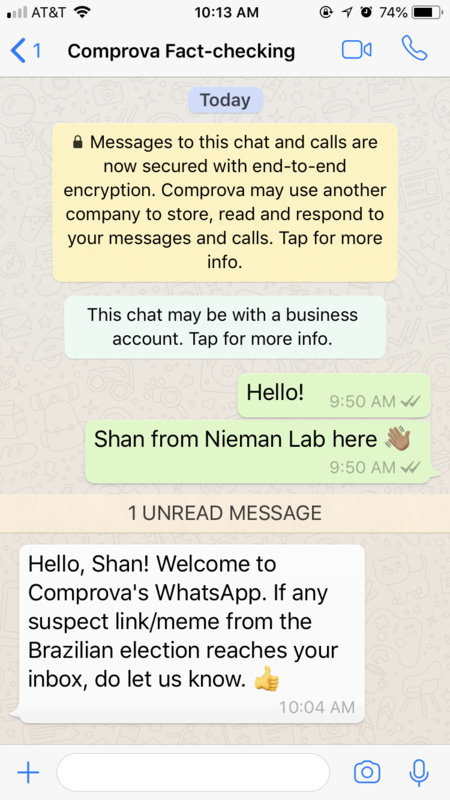 But the newsrooms in Comprova will benefit from access to the just-launched WhatsApp Business API, which will allow newsrooms on the Comprova side to respond to reader submissions (and refute misinformation) at significantly greater scale. WhatsApp is a black box of viral — and deadly — misinformation many news organizations have been trying to hack for years. Verificado, which recently wrapped up its 2018 fact-checking collaboration for the Mexican elections, managed to handle tens of thousands of messages through its WhatsApp hotline. The Colombian news outlet La Silla Vacía tried to help its fact checks spread on WhatsApp by asking readers who submitted a question to commit to sending the fact check to their friends on the platform. WhatsApp itself is reportedly building a team in India to help deal with the spread of fake news on its platform. The WhatsApp number will accept questions and tips from the public, and will facilitate the detection of trends in misinformation reported around the country. Researchers at the Harvard Kennedy School will later investigate how misinformation circulates on WhatsApp. The findings will help inform newsroom best practices for requesting tips about misinformation and disseminating debunks to the public on WhatsApp. Not all questions posed on WhatsApp will be answered, but journalists will strive to address content that has the potential to misinform a large proportion of the electorate. The website — the engine that powers the collaborative element of Comprova — has a proprietary content management system designed specifically for this project, and will be used in future election projects around the world. As was the case in the CrossCheck fact-checking projects, no stories can be published for the public until three newsrooms in the consortium sign off on the verification process and conclusion. The Google News Initiative and Facebook Journalism Project are providing funding and technical assistance and training for Comprova. Abraji, the Brazilian investigative journalists association, is coordinating the consortium, with additional support from the journalism institute Projor. You can visit the project site (in Portuguese) here, which includes a full list of partners. First Draft’s English-language site is here.